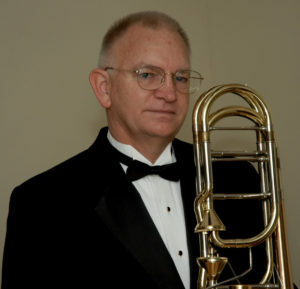 Dave has been a member of the Folsom Symphony since 2009. He holds a Bachelors degree in Music Education from Florida State University, retired from teaching in Tallahassee, Florida in 2005, and returned to Sacramento to reestablish his original music roots. He particularly enjoys subbing in the area orchestras, jazz bands, symphonic bands, and musical pit orchestras. He also appears in various brass ensembles, trombone quartets, and church ensembles. Although a dedicated bass trombone player, you may find him playing his tenor trombone in jazz bands.